Some 125,000 refugees living in the most affected Bekaa area in eastern Lebanon have received winter kits and 55,000 more will be reached in the coming days. 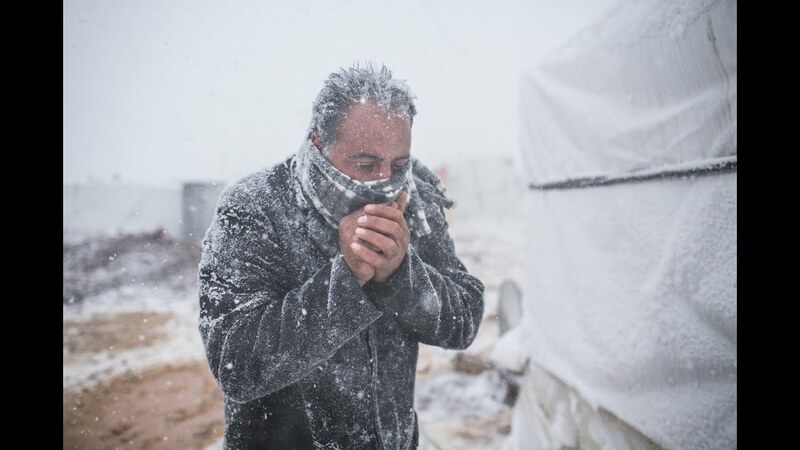 BEIRUT, Lebanon, December 12 (UNHCR) - The UN refugee agency is stepping up measures to protect the hundreds of thousands of Syrian refugees in Lebanon, including 120,000 living in flimsy tents, as they face the onslaught of a massive winter storm in the region. With the support of the Lebanese armed forces, UNHCR and NGO partners were able earlier this week to speed up the distribution of additional emergency shelter kits - including plastic sheets, timber and tools - to thousands of refugees living in tents in the Bekaa Valley, eastern Lebanon, so far the region most affected by the massive storm system dubbed "Alexa." Emergency teams continued on Wednesday, despite blocked roads from the weather conditions. Alternative shelters are also being prepared for refugees whose tents may be affected by the snow, rain and flooding. Some 125,000 refugees living in the Bekaa have received winter kits and 55,000 more will be reached in the coming days. Humanitarian agencies working throughout Lebanon have distributed 255,000 blankets and more than 6,000 stoves in the past months. Some 45,000 ATM cards (each holding US$150 in value) have also been given to vulnerable families to buy additional stoves and fuel. Storm Alexa struck Lebanon on Tuesday night, bringing snow to higher areas and rain elsewhere, accompanied by high winds. According to forecasts, conditions are expected to remain difficult for several days, with further snow expected. Reports from Syria and parts of Turkey spoke of similarly grim conditions there. UNHCR is particularly concerned for the many refugees in Lebanon living in makeshift accommodation, as their homes are fragile and substandard. The number of refugees in Lebanon has increased five-fold over the last year. "For the hundreds of thousands of refugees in Lebanon, as well as those in neighbouring countries and the displaced in Syria, a storm like this creates immense additional hardship and suffering," said Amin Awad, director of UNHCR's Middle East and North Africa Bureau. "With Lebanon's help, we're doing everything we can to get rapid additional help to people who most need it. This is on top of the winter preparations already done over the past months." A host of other humanitarian agencies are working on the winter response in Lebanon, including the World Food Programme, the Norwegian Refugee Council, the International Organization for Migration, Oxfam, Medair, Save the Children, World Vision, Humedica, Mercy Corps, Caritas, Handicap International, Concern, Acted, Danish Refugee Council (DRC)and UNICEF. The UN refugee agency began distributing thermal blankets and other items beginning in November. Across the Middle East UNHCR has distributed some 70,000 plastic tarpaulins to help refugees better prepare their tents and shelters for winter while some have received electric or kerosene heaters. WFP and its partners are meeting the food needs of newly arrived Syrian refugees in areas affected by the storm in Lebanon with food stocks sufficient to feed 150,000 people. Elsewhere in the country, the UN food agency is providing food assistance to over 600,000 Syrian refugees registered with UNHCR using electronic food vouchers. Lebanon is at present the largest Syrian refugee-hosting country in the region, with almost 840,000 Syrians either registered as refugees or awaiting registration. Unlike other countries neighbouring Syria, there are no established refugee camps. Instead people are living in the community in nearly 1,600 different areas. Lebanon has responded generously to the influx, and earlier this week authorized the use of the Lebanese military to help UNHCR in speeding up the delivery of winter aid. As of Wednesday, efforts were focused on getting help to some of the worst affected sites in the Bekaa. In Turkey, UNHCR field teams were blocked from visiting camps around Kilis today due to snow blocking roads in that region. With almost 2.3 million Syrian refugees around the region and millions more people displaced internally in Syria, winter conditions are a major worry across the humanitarian community. Winter preparation work, involving improvements to shelters, heating, blankets and clothing, has been under way for months. The first cross-border airlift from Iraq into north-east Syria, bringing additional humanitarian winter materials to displaced populations there, is expected to launch later this week - weather permitting.